Here's a fun neighbor-shaming McDonald's billboard from DDB Stockholm. 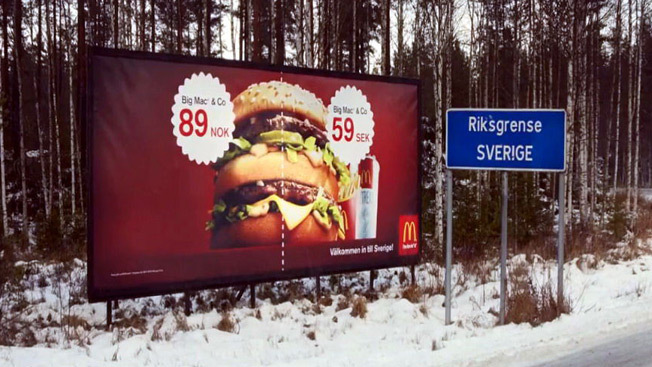 Sitting right at the border between Sweden and Norway, the billboard displays comparative pricing for Big Macs in the two nations—egging on Norwegians to take advantage of Sweden's cheaper burgers. In other words, it's the rare fast-food ad that doubles as fodder for exchange-rate geeks. DDB points out that Norwegians are already crossing the border for bargains in droves. So really, the agency is just reminding them to stop for a more affordable heart-stopper. How much will they save? In Norway, a Big Mac costs the equivalent of about $14.41, says the billboard. In Sweden, it's only about $9.08. Of course, that's still way too much for a Big Mac—especially if they're made in any way like the brand's Chicken McNuggets.